Washington, D.C. — WoodWorks – Wood Products Council, in cooperation with the USDA Forest Service Forest Products Lab and Softwood Lumber Board, conducted a second series of blast tests on three existing two-story, single-bay cross-laminated timber (CLT) structures at Tyndall Air Force Base — the same structures involved in a series of initial blast tests performed in 2016. Onsite observations were decidedly positive; all structures remained intact under significant explosive loading well beyond their design capacity. Additional videos of the testing along with the Phase 1 Summary Report are now available on the WoodWorks website at http://www.woodworks.org/publications-media/blast-testing-research. Four tests were performed covering a spectrum of blast loads. For tests one and two, the size of the blast load and configuration of the structures were the same as prior testing, except the structures had axially-loaded front panels. The loads applied were intended to simulate conditions associated with a five-story residential or office building. For tests three and four, different variables were altered on each of the buildings. One building used five-ply CLT front wall panels, the second used off-the-shelf prefabricated angle brackets, and the third included nail-laminated timber (NLT) front panels. Reflected pressure, peak deflections, and panel acceleration were recorded at front and side faces in order to compare results to previous testing. As with the tests performed in 2016, peak recorded deflections were consistent with pre-test predictions indicating the effectiveness of design assumptions and methodology in predicting elastic response of CLT to dynamic loads. 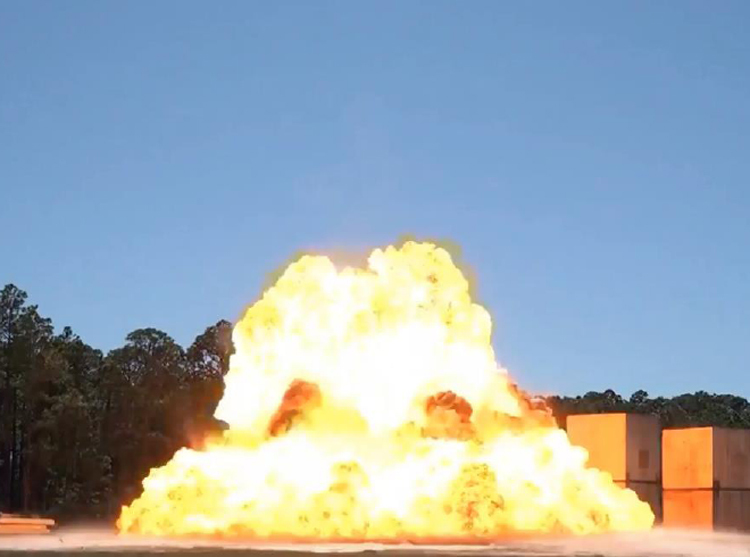 The second test also indicated a controlled response in which localized panel rupture was observed but connection integrity and load carrying ability were not compromised for any of the loaded structures. Of particular note, all three structures remained standing following the fourth and largest blast, intended to take the structures well beyond their design intent. While panel rupture was expected and observed on all front and side wall panels, the buildings maintained enough residual capacity to remain intact and safe to enter. In addition to funds provided by the USDA Forest Service Forest Products Lab and Softwood Lumber Board, this project was made possible by labor and material donations from a number of sources. All construction and deconstruction was provided by Lendlease. Each structure used a different grade of CLT, and these products were provided by DR Johnson, Nordic Structures and SmartLam. Connectors tested included self-drilling screws provided by MyTiCon, adhesive anchors provided by Hilti, and angle brackets provided by MiTek and Simpson Strong Tie. Doors were provided by American Direct. WoodWorks worked with Karagozian & Case, Inc., the Air Force Civil Engineer Center and the U.S. Army Corps of Engineers to analyze the results of these tests. The results will now be applied to the development of design methods for use by blast engineers across the country.